When all else fails when you are sick and need to have something on your blog, go back into the archives and pick out a few of your favorite projects. Today I am sharing with you my Merry Christmas Card I made when I was on the Couture Creations Design Team. I hope you enjoy the tutorial using Couture Creations Nesting Dies along with the Wrapped in Joy Collection. I proceed til I had three circles cut...to help them stay in line I used a bit of washi tape just to hold it into place. After I had placed my papaer pieces on my cream card base using Couture Creations two sided tape I placed the circles that I had previous cut back on to the card front with Mounting Foam Tape...I love using double sided paper...this makes this technique so easy to do. Love how the scallop border that has been embossed gives a bit more dimension to my card front. I want the inside of my card to be as special as the front, so here is a peek at the inside, I placed the angel sicker to the bottom using Mounting Foam Tape from Couture Creations...I hope you try making a special inside of your cards. Christmas is just a few days away and I just have to share with you my Noel Banner I made using Xyron and Echo Parks Christmas Papers. I began by covering my banner pieces using a Glue Stick from Xyron. Once all the banners were covered...I used an Xacto Knife to cut the excess paper off. Make sure to punch my holes through once the glue has set. Add a couple of border strips to two of the banners using your Xyron Mega Runner from Teresa Collins. using my Create A Sticker Maker. 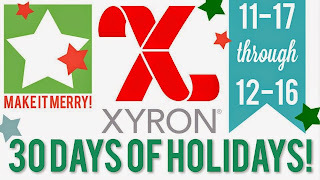 Add the letters to the banners once you have them covered using your Xyron Glue Stick...make sure to have a sharp blade on your Xacto knife and a small sanding block to give the edges a finished look. For my letter "O" Banner I added more of the semi-circle pieces that I ran through the Create a Sticker Maker and added the "O" that was cover to the banner. I placed a small twine bow on each piece using Xyron Adhesive Dots. On my letter "E" Banner I added fussy cut holly leaves to the top of my banner once I had placed my doilies and circle on the top of the banner. The letter "L" Banner is finished with a few small flags that I added to the top of my letter using Xyron Adhesive Dots. Pretty Christmas packages and of course Christmas decorations to be made. Today I am sharing with you how to make a Painters Tray using Teresa Collins new Thankful Holiday Pocket Dies and Perky Peacock Embossing Folder. I began by running a piece of Red Core'dinations paper through my Cut N'Boss using the Perky Peacock Embossing folder and cutting it to fit each of the rectangles. Once the embossing paper is in each section, it is time to decorate. I began by taking a Santa Claus Die cut from the Candy Cane Collection and cut about 20 or so holy leaves from the the Thankful Holiday Die Set and place them around the Santa image to form a wreath. Cut out two of the Christmas Trees from the Thankful Holiday Collection, one will be the base and the other you will cut into pieces to form a folk art tree. Once cut and layered add borders you have cut using your Cut N Boss and border die, adhere to the front of the tree. Punch 3 small Santa heads, add to the tree using pop dots. Cut a star using the Tree Die and add to the top of the tree. I love the Folkart look of the Christmas Tree, don't you? Cut a Snowflake Die using your Cut n Boss and place on the edge of your Painters Tray. along with a pretty stamped image to the tray, adding some bling, ribbon and berries here and there. Have you seen Eileen Hull new Vintage Kitchen Dies...they are amazing. I am sharing with you the Canister Die and how easy it is to make into a gift giving project. I love to give candy, cookies and other treats to friends that pop in...so sometimes I fill container with homemade or store bought items. I began by first cutting on the Canister Die, remember to cut two of the sides out and then stained it with some Brushed Corduroy Distress Stain. Any one that knows me knows I love Graphic 45 and thought the 12 Days of Christmas Collection would be perfect to use on my canister. I fussy cut the pear image out twice and layered them together, twisted the ribbon to make it look like it was in flight using a small dowel rod and added a few flowers...some I fussy cut out and others I punched out and layered together. For the top of the canister I added a Doily Die cut, metal frame and a large bead I found in the jewelry section of our local craft store. I then added a fussy cut bird from the Christmas paper along with another flower I made. Remember: You can have a chance to get creative by entering the Art with Heart Challenge!!!! So Check it out HERE!!! December Daily Day Two is about being "Merry" and what better way but to go check out gift wrap, ornaments and ending the day with a glass of great wine. So I went to a couple of our local craft stores and took a few photos of the holiday isles to add to my December Daily layouts and pages...I love decorative bags that I may add my own creative style to so I know I will be getting a few of these. I used the back of my December One page for my layout adding some Simple Stories Paper and border punches to the bottom of the page. 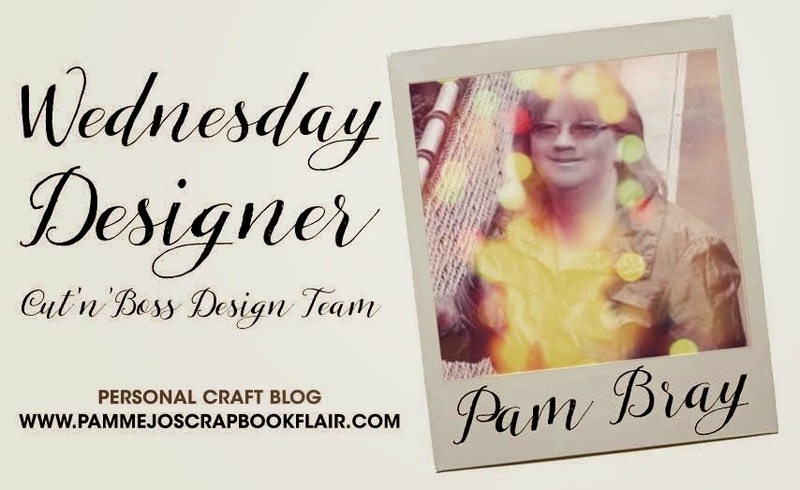 I used a WeR Memory Keepers Doily along with my Cut N' Boss to make this fabulous doily for my two page layout. The fun Christmas Tree is an old rub on from Pink Paislee. I added a few flags along with another of the rub-ons. For the second page in my book I selected a page protector that had 3 slots, for the first one I placed a journal block on a piece of inked corrugated paper. Adding this to a piece of Simple Stories paper, wrapping it with some brown twine and placing an epoxy circle over the number two prior to placing it in the sleeve slot. For the accompanying slot I placed a matted photo of my glass of wine on to some to the Simple Stories paper along with a brad from Pink Paislee. 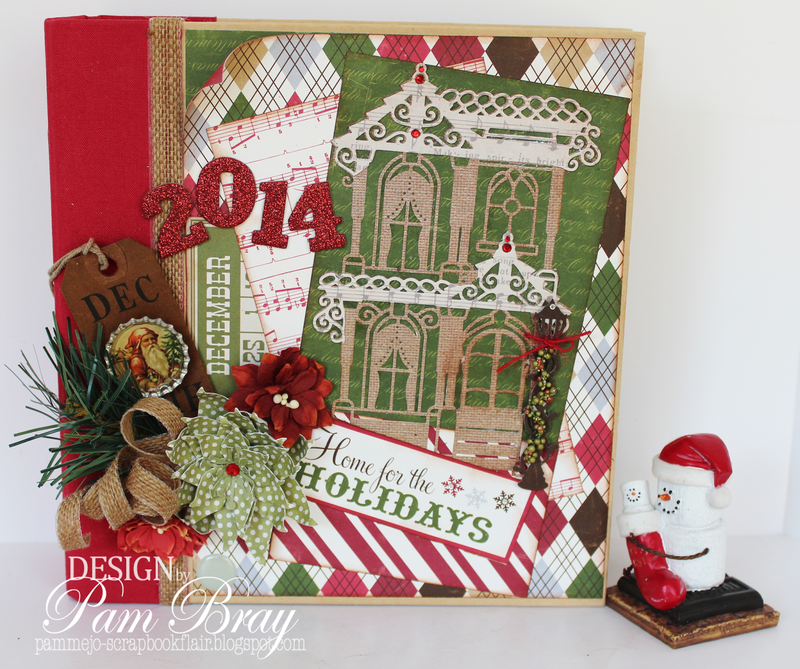 Love the "Merry" journal block and numbers that are a part of the Simple Stories Collection. I added a piece of inked corrugated paper to the top of the journal block and added another of the doily die cuts to the block along with a giant button, the number two and sticker letters. I love how it turned out, don't you. Make sure you check out Day One HERE!!! And the Cover to my December Daily HERE!! !